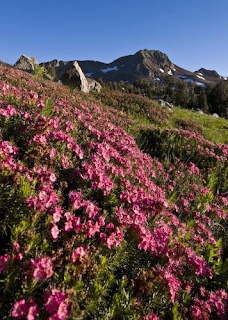 A great year for wildflowers in the Sierras! Everywhere I go I am there, and I am seeing a profusion of wildflowers. Lupines are at their best in years. Low lupine, tall lupine, lots of lupine. Mules ear are doing great as are tiger lilies, indian paint brush, and all the usual suspects. 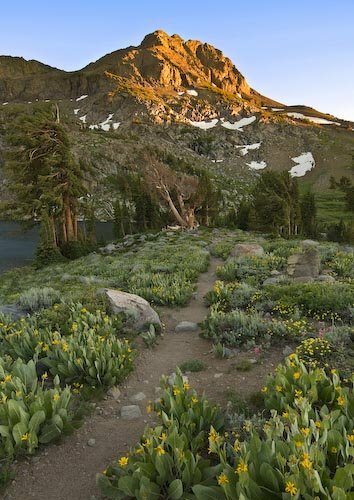 Go take a hike and enjoy the wildflowers! Do it now! The dry season will bring an early end to the wildflower season. The higher you go, the better the chances to see lots of flowers. I recently took an early evening hike from Woods Lake to Winnemucca Lake (see photos). I left at 5:30 pm and got back to the car at dark. If you go late, take a flash light (Woods Lake is off Hwy 88 west of Carson Pass). If you live elsewhere in the country, let me know how your wildflowers are doing.